Despite tremendous advancements in medicine, the number of oral cancer cases continues to increase, and the need for integrating alternate medicine or adopting an integrative approach has become a compelling cost-effective requirement for the management and treatment of diseases. Conventional treatment of oral cancer involves surgery followed by radiotherapy with or without chemotherapy which causes several complications including poor quality of life and high chances of recurrence of cancer. Oral cancer is often linked with obesity which is major risk factors in other cancers. Apart from obesity, oral cancer is thought to have an inverse relation with neurodegenerative disorders presumably because cell death decreases in the former case and increases in the latter. Ancient mind–body techniques such as yoga have not been adequately tested as a tool to synergize the cellular equilibrium pertaining to the treatment of oral cancer. Nerve growth factor (NGF), tumor necrosis factor-alpha (TNF-α), and interleukin-6 (IL-6) are among the early experimental cellular biomarkers that may be used to probe the modulation of oral cancer, obesity, and neurodegenerative disorders. 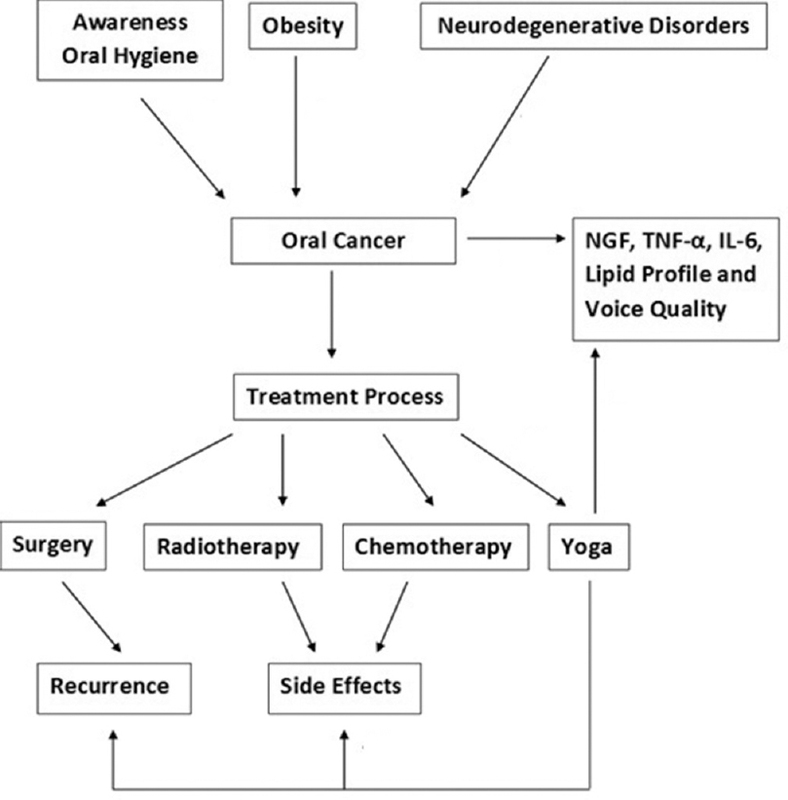 Yoga has been reported to influence these molecules in healthy individuals but whether their expression can be altered in patients of oral cancer by yoga intervention is the subject of this research being discussed in this review article. Therefore, the present article not only reviews the current status of research studies in oral cancer, obesity, and neurodegenerative disorders but also how these are linked to each other and why the investigations of the putative NGF pathway, involving TNF-α and IL-6, could provide useful clues to understand the molecular effects brought about by yoga intervention in such patients. Telomeres, the repetitive sequences that protect the ends of chromosomes, help to maintain genomic integrity and are of key importance to human health. 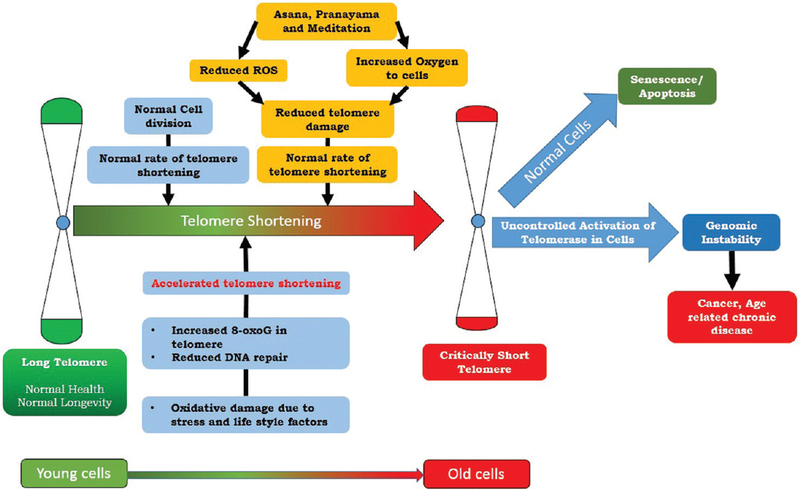 Telomeres progressively shorten throughout life and a number of studies have shown shorter telomere length to be associated with lifestyle disorders. Previous studies also indicate that yoga and lifestyle-based intervention have significant role on oxidative DNA damage and cellular aging. However, very few publications investigate telomere stability and its implication from the point of view of asana, pranayama, and meditation. In this context, a review was conducted to systematically assess the available data on the effectiveness of asana, pranayama, and meditation in maintaining telomere and telomerase. Literature search was performed using the following electronic databases: Cochrane Library, NCBI, PubMed, Google Scholar, EMBASE, and Web of Science. We explored the possible mechanisms of how asana, pranayama, and meditation might be affecting telomere length and telomerase. Moreover, results showed that asana and pranayama increase the oxygen flow to the cells and meditation reduces the stress level by modulating the hypothalamic–pituitary–adrenal axis. Summing up the result, it can be concluded that practice of asana, pranayama, and meditation can help to maintain genomic integrity and are of key importance to human health and lifestyle disorders. Context: The purpose of this study was to measure the oxygen consumption (V̇O2) during Viniyoga yoga movements (asanas) and to compare V̇O2walking among adults. Methods: Yoga practitioners (n = 10) were recruited to measure V̇O2while at rest (30 min), practicing yoga (16 movements with different variations), and treadmill walking at 2 mph (10 min) and 3 mph (10 min). V̇O2was measured using a whole-room indirect calorimetry. Each yoga movement was categorized by body orientation as standing, lying, and sitting. The differences in V̇O2between yoga and walking were examined using Pearson's correlations. Differences in V̇O2between poses (standing, sitting, and lying) were examined using linear regression models. V̇O2. Results: Mean yoga-V̇O2for the entire yoga session was 3.7 (standard deviation [SD] 0.43, range: 4.4–8.9) ml/kg/min. Yoga-V̇O2varied by body orientation: standing = 7.5 (SD = 1.5) ml/kg/min, lying = 5.3 (SD = 1.0) ml/kg/min, and sitting = 5.4 (SD = 1.1) ml/kg/min. After adjusting for body mass, frequency of yoga practice, and resting energy expenditure, female gender was negatively associated with mean yoga V̇O2for standing (B = −112.19, P < 0.05), lying (B = −141.87, P < 0.05), and sitting (B = −129.96, P < 0.05). Mean V̇O2for walking 2 mph was comparable with sitting (r = 0.836, P < 0.05) and lying (r = 0.735, P < 0.05) whereas walking at 3 mph was comparable with standing (r = 0.718, P < 0.05) and sitting (r = 0.760, P < 0.05). Conclusion: We conclude that V̇O2during yoga practice is comparable to V̇O2during slow treadmill walking and may vary based on gender and body orientation. Context: Yoga has origins speculated to date back to pre-Vedic Indian period and is practiced as a common exercise, both in India as well as all around the world. Although the yoga practices are ages old, there is not much research literature available. Moreover, with the advancement in technology, the modern analysis tools are not used up to their full potential. Aims: This research focuses on developing a framework for analyzing trikonasana, using the optical motion capture system, and validating the noninvasive method for analyzing muscle activity in prominent muscles while performing trikonasana. Subjects and Methods: We have adopted the noninvasive analysis method using optical motion capture system OptiTrack™ for recording the human motion and musculoskeletal modeling software LifeMod™ to analyze the muscle activity while performing trikonasana. Surface electromyography (sEMG) studies were performed using Trigno™ (Delsys Inc.) wireless sEMG sensors to validate the LifeMod simulation results pertaining muscle activation. Results: It was observed that the characteristics of the sEMG match to that of the estimated muscle tension from the architecture used in this study. The muscle groups such as external right obliques muscles, rectus abdominis of the front leg, and gluteus maximus and gluteus medius of the rear leg were observed to undergo major activation during an isometric contraction while performing trikonasana. The magnitudes of the muscle tension during the left bend depict a close resemblance to the muscle tension magnitudes during the right bend. Conclusions: The optical motion capture system and musculoskeletal modeling software can be used to analyze muscle activity in any yoga exercise noninvasively. Since the yoga exercises majorly require the practitioner to maintain a certain posture for a considerable duration, our approach can be used to find the important muscles involved and their corresponding muscle tension when they undergo isometric contraction. Background: Chronic low back pain (CLBP) adversely affects quality of life (QOL) in nursing professionals. Integrated yoga has a positive impact on CLBP. Studies assessing the effects of yoga on CLBP in nursing population are lacking. 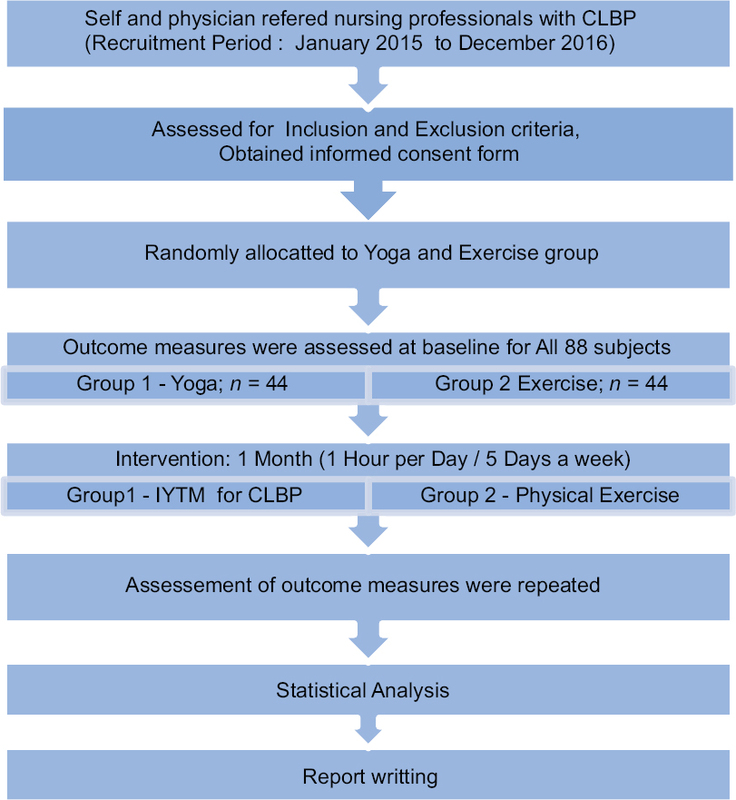 Aim: This study was conducted to evaluate the effects of integrated yoga and physical exercises on QOL in nurses with CLBP. Methods: A total of 88 women nurses from a tertiary care hospital of South India were randomized into yoga group (n = 44; age – 31.45 ± 3.47 years) and physical exercise group (n = 44; age – 32.75 ± 3.71 years). Yoga group was intervened with integrated yoga therapy module practices, 1 h/day and 5 days a week for 6 weeks. Physical exercise group practiced a set of physical exercises for the same duration. All participants were assessed at baseline and after 6 weeks with the World Health Organization Quality of Life-brief (WHOQOL-BREF) questionnaire. Results: Data were analyzed by Paired-samples t-test and Independent-samples t-test for within- and between-group comparisons, respectively, using the Statistical Package for the Social Sciences (SPSS). Within-group analysis for QOL revealed a significant improvement in physical, psychological, and social domains (except environmental domain) in both groups. Between-group analysis showed a higher percentage of improvement in yoga as compared to exercise group except environmental domain. Conclusions: Integrated yoga was showed improvements in physical, psychological, and social health domains of QOL better than physical exercises among nursing professionals with CLBP. There is a need to incorporate yoga as lifestyle intervention for nursing professionals. 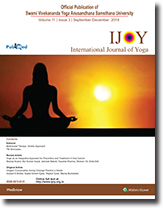 Background: Previously, yoga bellows-type breathing (bhastrika pranayama) reduced reaction time (RT) or reduced anticipatory responses in male participants or a mixed group of male and female participants. Aims: The present study as a control trial aimed to assess the effects of yoga bellows-type breathing on RT in females exclusively. Methods: The sample consisted of 25 healthy females, aged between 19 and 32 years (group mean ± standard deviation, 22.8 ± 3.5 years). All of them had prior minimum experience of yoga including yoga bellows-type breathing of 12 months. 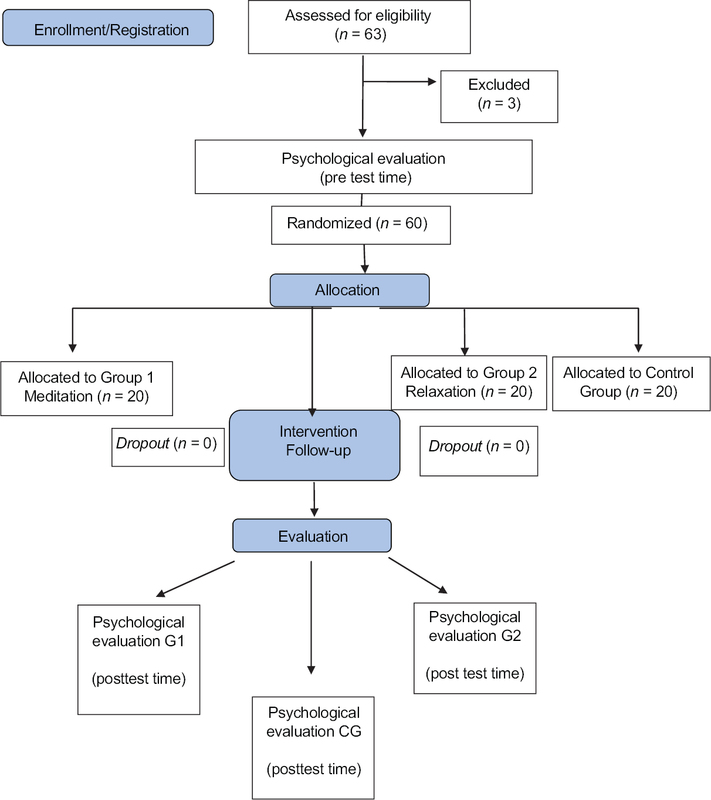 The RT was assessed in each participant before and after three randomized sessions differed in the intervention given held on three separate days. The sessions were (i) YOGA bellows-type breathing or bhastrika pranayama(BHK), (ii) Breath awareness (BAW), and (iii) Sitting quietly (CTL) as a control session. The duration of the intervention was 18 min, and the participants were assessed for RT before and after the intervention. Results: Repeated measures ANOVA, post hoc tests with Bonferroni adjusted showed that the time taken to obtain a correct response reduced significantly after 18 min of BAW (P < 0.05) and CTL (P < 0.05). However, no changes were seen in the RT after BHK. Conclusions: The results suggest that different interventions may optimize performance in tasks requiring attention in females compared to males. Background: Obesity is a growing global epidemic and cause of noncommunicable diseases. Yoga is one of the effective ways to reduce stress which is one of the causes of obesity. Nowadays, children in adolescent age are more prone to get obese due to lack of physical activity making them more sedentary. Aim: To identify the design and validation of Integrated Approach of Yoga Therapy Module (IAYTM) for obesity in adolescents. 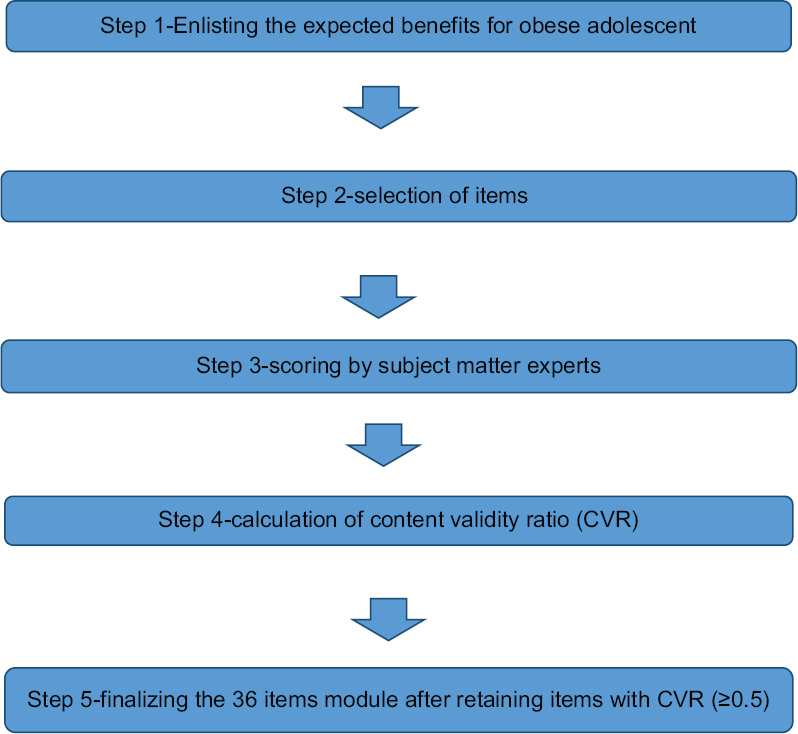 Materials and Methods: First phase – IAYTM for obesity was designed based on the literature review of classical texts and recently published research articles. Second phase – Designed IAYTM was validated by 16 subject matter (yoga) experts. Content-validity ratio (CVR) was analyzed using Lawshe's formula. Results: Yoga practices were designed for Integrated Yoga Module for Obesity in Adolescents. Yoga practices with CVR ≥0.5 and which were validated by 16 yoga experts and approved in faculty group discussion were included in final Integrated Yoga Therapy Module. Conclusion: The yoga practices were designed and validated for IAYTM for obesity in adolescents. Glaucoma is the most common cause of irreversible blindness worldwide, with >65 million sufferers. It is incurable and the only therapeutic approach accepted till now is the lowering of intraocular pressure (IOP) medically and/or surgically. These known interventions might have many side effects and complications. Yoga-based interventions are now well accepted as alternative therapy in many chronic diseases. The effects of yoga in glaucoma, however, have not been studied adequately. Accommodation (the process of adjustment of optical power to maintain clear vision) of eyes leads to instant lowering of IOP. Therefore, we hypothesize that one of the yoga-based interventions, Tratak kriya, which includes ocular exercises might lead to lowering of IOP in glaucoma patients. The proposed Tratak kriya leads to contraction and relaxation of ciliary muscles which might increase outflow of aqueous humor. In addition, this yoga-based intervention might decrease stress and improve quality of life in glaucoma patients. Background: Yoga as a mind–body therapy is useful in lifestyle-related disorders including neuropsychiatric disorders. In schizophrenia patients, yoga has been shown to significantly improve negative symptoms, functioning, and plasma oxytocin level. Aim: The aim of the study was to study the effect of add-on yoga therapy on social cognition in schizophrenia patients. Materials and Methods: In a single pre-post, study design, 15 schizophrenia patients stabilized on antipsychotic medication for 6 weeks were assessed for social cognition (theory of mind, facial emotion recognition, and social perception [SP]) and clinical symptoms (negative and positive symptoms and social disability) before and after twenty sessions of add-on yoga therapy. Results: There was a significant improvement in the social cognition composite score after 20 sessions of yoga (t = −5.37, P≤ 0.001). Clinical symptoms also reduced significantly after twenty sessions of yoga. Conclusion: Results are promising to integrate yoga in clinical practice, if proven in well-controlled clinical trials. Background: Yoga is proven beneficial in improving quality of life among breast cancer survivors receiving chemotherapy, but its effectiveness in lymphoma patients needs to be explored. As chemotherapy-induced neutropenia is very common among lymphoma patients, they are much prone to infections from the environment. Furthermore, trained yoga instructors are not available in every setting, so there is a need to develop home-based yoga program modules for lymphoma patients receiving chemotherapy. Aim: The aim of the study was to explore the feasibility and safety of yogic exercises among lymphoma patients during chemotherapy. Subjects and Methods: An interventional, single-arm prepost design study was conducted at a tertiary health-care center. Patients suffering from malignant lymphoma (18–65 years) with Eastern Cooperative Oncology Group performance status from 0 to 2, planned to receive chemotherapy were administered a home-based yoga program over a period of 2 months from the start of chemotherapy. The primary outcome variables were retention rate, acceptance rate, safety, and adherence. 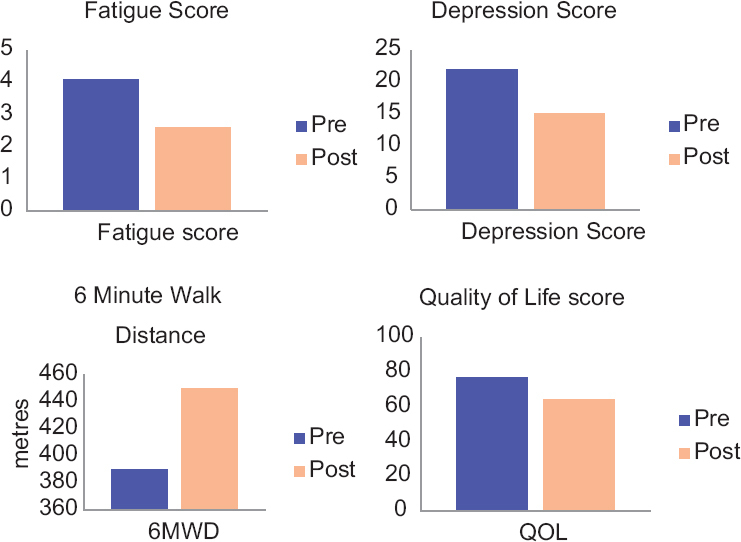 Health-related quality of life (HRQOL), fatigue level, overall sleep quality, depression, anxiety level, and pain were also assessed. Statistical Analysis: Descriptive statistics was used to see the feasibility and adherence. The paired t-test was used to compare various pre and postintervention outcome measures. Results: Fourteen patients (median age: 36 years, range13–65 years) of malignant lymphoma were enrolled in the study. Male-to-female ratio was 9:5. Non-Hodgkin's lymphoma patients constituted 64%. The recruitment rate was 93%. Favorable retention (100%), acceptability (97%), adherence (78.6%), and no serious adverse events following yoga practice were reported. Improvement was also found in HRQOL, fatigue, sleep, depression, and anxiety. However, it needs further validation in a randomized study. Conclusion: Home-based yoga program is safe and feasible among the patients suffering from malignant lymphoma receiving chemotherapy.